The County Cess and Valuation Rolls were compiled prior to 1855 for the purpose of tax collection. The tax applied only to land owners and not tenants. The Perth Burgh and Stent Rolls list the county inhabitants who were required to pay taxes within the burgh. All the rolls contain names, which are normally followed by occupations, of either the proprietor only or the tenant and the proprietor together. The fields to be keyed are: Proprietor Name, Tenant Name, Parish, Year, and Call Number. There are two form types from which to choose in order to key the fields: Tax Roll and Book Cover/ Title Page. A third form type is Index which is needed to separate out any index images but from which nothing is being keyed. The Valuation rolls describe the property, name the proprietors and tenants, and contain the annual rental value. Up until 1884 tenants with leases less than one year and a low rental value were omitted. This project spans the years 1857-1899. The Registers of Voters in Fife, Scotland are legible registers containing both typed and handwritten pages spanning the years 1831 to 1894. Only three fields will be keyed: Residence, Year, and Name. For more on the World Archives Project, and for details on how to participate with the transcription work, visit http://community.ancestry.co.uk/wap/dashboard.aspx. Leading UK family history website findmypast.co.uk has today expanded its collection of British military records with the release of the Royal Marine Medal Roll 1914-1920. The record set provides a listing of all Royal Marines who received medals for their service in World War 1, including those awarded the 1914 Star, the Clasp to the 1914 Star, the 1914-15 Star, the British War Medal and the Victory Medal. Containing records of over 75,000 Officers, NCOs and other ranks, the Royal Marine Medal Roll 1914-1920 comprises both transcripts and images of the original WW1 Campaign Medal Rolls for the Royal Marines. Aside from the medals awarded, the records detail the Marine’s name, rank, service branch, service number and also a description of where or to whom the medals were issued. In addition to this, many of the transcripts contain extra service details for the Royal Marine, often highlighting those that died of wounds or were killed in action during WW1. These details are available online for the very first time. I've picked up from the Salt Lake City Tribune that Ancestry will soon be releasing a Mac version of the family tree building programme Family Tree Maker. Good news for Mac users, who don't seem to get many options on that front! The article also discusses the Family Search Beta site at http://fsbeta.familysearch.org/ which hosts the same records also found on the Record Search pilot, with many more recoirds added this week. You could be forgiven for being confused by all the different FamilySearch sites, but the article states that this Beta site will be integrated into the main FamilySearch site (www.familysearch.org/) in the next few weeks, so potentially interesting times ahead. The full article is at www.sltrib.com/utah/ci_14976434. UPDATE 30 MAY: There's more on the new Mac programme at http://blog.eogn.com/eastmans_online_genealogy/2010/04/ancestrycom-announces-new-macintosh-version-of-family-tree-maker.html. Respected Scottish genealogist and author Donald Whyte passed away, aged 84, on Friday April 23rd. An obituary can be read online at http://announce.jpress.co.uk/3917842. The funeral will be this Thursday April 29th at Kirkliston Parish Church, at 2.00pm. Donald was a founding member of the Scottish Genealogy Society in 1953 and a current honorary vice-president. Overseas readers may be familiar with many of his books, including A Dictionary of Scottish Emigrants to the USA and A Dictionary of Scottish Emigrants to Canada before Conferderation, as well as other Scottish based genealogical titles. II. To increase the number of collections publicly accessible. III. To raise the profile of business archives with the public. IV. To raise standards in their care. To view the document, visit http://businessarchivesscotland.blogspot.com/2010/04/consultation.html or directly via www.gla.ac.uk/media/media_148091_en.pdf. A new display of images from the Scottish Theatre Archive has been placed online by the University of Glasgow. To view the display, and for more information, click on the following link: Scottish Theatre Archive. "In 1841, when he left his role as Chief Secretary for Ireland, the Yorkshire aristocrat George Howard (or Viscount Lord Morpeth as he was better known), was presented with a leaving card. Nothing unusual there – except this leaving card was in the form of a giant paper scroll over 400 metres in length, containing the names and addresses of an estimated 300,000 men from all over Ireland and from every level of Irish society! "Presented to him at a ceremony in Dublin, the roll was packed into its mahogany box and returned to his family home, Castle Howard in North Yorkshire. It remained there in the archive until 2009 when it was sent to National University of Ireland at Maynooth, to be conserved, studied and – crucially – unrolled." Dan's job is to look for new content for possible digitisation by Ancestry. Read his full post at http://blogs.ancestry.com/uk/2010/04/26/is-this-the-worlds-longest-document/. Dear God, let's hope he gets this online! Your Family Tree magazine, produced by Future Publications, is advertising for a new editor at www.journalism.co.uk/75/articles/538416.php. Family History Monthly issue 183 (June 2010) landed through my letterbox today, and this month is an Irish special. I've written for the magazine in the past, but as of this edition, I am now writing the Online section of the magazine, and so to tie in with the special this shuggy/Paddy hybrid has produced a write up of all the latest online Irish developments as well as an indepth guide to the PRONI website from Belfast. Also on the Irish front, Ian Maxwell provides a beginner's guide to tracing Irish ancestors (including a very handy research directory), Joe O' Neill goes in search of Irish emigrants and Catherine Allington goes in search of Irish ancestors in Montana. But it's not just Ireland that gets a fair wind this month. Keith Gregson visits the National Maritime Museum in Cornwall, Karen Foy looks at the invention of the lawnmower and the history of vetinary surgeons, whilst Ben Palfreyman looks at West Coventry FHS. Last, and certainly not least, this issue also sees the first in another new regular column, from my southern based matey Bob Blatchford, editor of the Family and Local History Handbook and organiser of the National Family History Fair. Each month Bob will be sharing his thoughts on the genealogy world at large, and this month he gives his perspective on the changing nature of family history fairs and the new price rises from the English GRO for certificates. Family History Monthly - £3.75 and packed with goodies! Please note that the Historical, West and Legal Search Rooms will not open until 10am on Tuesday 11 May 2010. The NAS Search Rooms will also be closed on Monday 3 May 2010. 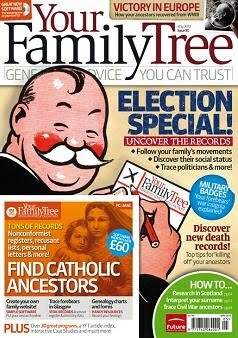 The latest issue of Your Family Tree (May 2010, issue 90) is now on sale, and it's an election special. Thankfully, not in the celebrity sense, but in how to research electoral records. This month, editor Russell James explores the digital revolution, Mark Crail examines the records of how our ancestors once voted, Paul Reed explains the different military badges and insignia, Audrey Linkman examines portarits of people on holidays, and the maestro herself, Else Churchill, defines the Commonwealth Gap of 1642-1660, and how it affects genealogical research. There's articles on surname research and Roman Catholic forebears, whilst yours truly explains how to search for difficult to locate death records, and a whistle stop tour of the very best websites and archives for Glaswegian research, as well as some Q&As. Neil Darby looks at life after VE Day, and there are two fascinating case studies on a wife's horrific death, and adventures with Apache Indians! Outrageous value at £4.99 - get it now before the next government introduces a genealogy tax! "We have it on very good authority (Sharon Hintze, of the LDS church speaking at the Guild of One Name Studies Conference this April) that the IGI is going to be totally re-launched in a new format either later in 2010 or in 2011, with the extracted entries separated from the member submitted entries. This is going to be a major genealogy news event, so watch out for that. Meanwhile their Record Search pilot is adding new records almost every week. You can now search a prototype from What’s New section on the Family Search home page." It is possible that this somehow ties in with the New FamilySearch website set up that I announced on this blog last November. For more on that, see http://scottishancestry.blogspot.com/2009/11/new-family-search.html. Just to add to the Record Search comment - at Who Do You Think You Are? Live event earlier this year, I asked FamilySearch why there were no Scottish records going onto that site, when the free digitised English records going online through the site seem to have stepped up a gear. The answer was a simple case of not having permission to do so. So, very sadly, don't expect anything there in the near future from a Scottish perspective. In the meantime, don't forget that Pharos offers a range of affordable family history courses. I have just started teaching the next Scottish Research Online class - this session has become so popular that I am now running the chats on this twice a week, with double the number of students than the last time the course was run at the end of 2009! If you have not been able to join up this time, never fear, there will be another course hopefully from October. More information on each can be found at www.pharostutors.com. This is a nice release on the Internet Archive at www.archive.org/details/excursiontoscotl00anonuoft. It's an anonymous hand-written journal of an excusion to Scotland and back (from London) in summer of 1832. It includes a voyage from London to Stockton, then by land from Stockton to various points north to Edinburgh and Glasgow, then back to London via Carlisle and York. As a handwritten copy, the chances of tracking down another copy are practically nil! The book has several scenic postcards glued into it, and can be downloaded in PDF format. Pitsligo Castle Trust has been given an emergency loan of £100,000 for the restoration of both the castle and the adjacent kirk, which it is hoped will host both a Jacobite history centre and a heraldry centre. The Trust has secured funds from both Historic Scotland and the Rural Aberdeenshire Leader Programme, but the money will not be forthcoming intil November. For more on the story visit the Press and Journal's coverage at Pitsligo Castle Trust given emergency loan. Leading UK family history website findmypast.co.uk has revealed today that Conservative leader David Cameron and Boris Johnson, the Tory Mayor of London are in fact eighth cousins. This and many more fascinating revelations have been uncovered - some for the first time - when leading UK family history website findmypast.co.uk looked into the politicians' backgrounds using family history records on the findmypast website and other public records. David William Donald Cameron was born in 1966 in London to Ian Cameron and Mary Mount. The well-heeled Tory leader is a fifth cousin twice removed of the Queen and a seventh cousin of Princes William and Harry, and a descendant of William IV. David's paternal great-great-great-grandmother, Lady Agnes Hay and her parents, the Earl and Countess of Erroll can be found in the 1841 census on findmypast.co.uk. The Countess is David's royal link - Lady Elizabeth FitzClarence, the illegitimate daughter of William IV. Through Elizabeth, he is also related to Josslyn Victor Hay, 22nd Earl of Errol whose dramatic murder in Kenya in 1941 was depicted in the film White Mischief. However, perhaps the least known element of Cameron's background is that he is also a distant cousin of Boris Johnson, the Tory Mayor of London. Both descend from King George II (1683-1760) - albeit by illegitimate lines. The Scottish Cameron side of the family has also not been commonly explored. While Gordon Brown's ancestors were farming in Fife in the early 1800s, the Camerons were also tilling the land around Inverness. William Cameron, David's great-great-great-grandfather was recorded in the 1851 census as a farmer at Upper Muckovy, just outside Inverness. William's son Ewen then went into finance, and beginning a tradition of financiers that continued until David Cameron entered politics. The current Labour leader's background is well-known and often-discussed; he descends from a line of hard-working and upwardly mobile Scottish farmers and stonemasons. The prime minister was born James Gordon Brown in 1951 in Renfrewshire, the son of a Minister in the Church of Scotland, John Brown. Before that, the Browns were farmers in Fife for three traceable generations. There is however a little-known family secret in Gordon Brown's family's past, discovered by extensive searches through online records. One of Brown's great-grandfathers was born illegitimate in the late 1840s as a result of a relationship between a farmer's teenage daughter and a man 20 years her senior - a doctor of medicine who became a wealthy GP. Francis Troup Manson, a great-grandfather of Gordon Brown on his maternal line, was born illegitimate to Jessie Cruickshank, a farmer's daughter of about 16 years old. It is quite probable that the affair would have caused people to gossip in their small Highland village. Gordon's paternal grandfather was called Ebenezer Brown and his parent's, Browns great-grandparents, John and Mary Brown are recorded in the 1891 Scottish census living at Brigghills Farm House in Auchterderran, where John was a farmer. Nicholas William Peter Clegg is the youngest of the three leaders and was born in 1967 at Chalfont St Giles, Buckinghamshire to a Dutch mother and a half-English, half-Russian father. He speaks five languages and has by far the most cosmopolitan background of the three, with a Russian baroness as a grandmother and a Dutch mother who was once a Japanese prisoner of war in WWII. He is also currently married to a Spanish lawyer, which may explain his pro-European political stance. Nick Clegg's paternal grandfather Hugh Clegg married a baroness who was the granddaughter of the Russian nobleman Ignaty Zakrevsky. This nobleman had a daughter called Maria Ignatievna Zakrevskaya, born in St Petersburg in 1891, and Nick Clegg's great-great-aunt. She became a countess through her first marriage and then a baroness through her second. She was suspected of being a double agent, spying for both the Soviet Union and British Intelligence, leading to her being called the Russian Mata Hari. She was known to be a heavy drinker, and also had affairs with the writer H.G. Wells and the Russian literary giant, Maxim Gorky. She also wrote books and film scripts, including Three Sisters directed by Laurence Olivier in 1970. Like both Brown and Cameron, Clegg also has a more ordinary side to his family tree. In his direct paternal line, his great-grandfather was a schoolteacher and clergyman from Leeds who married a master mariner's daughter from Hull called Gertrude. John Clegg ran schools in Suffolk and Huntingdonshire. Nick's paternal great-great-grandparents, Simeon and Mary Clegg can also be found in the 1871 census. The couple were living at 3 Grange Street in Leeds and Simeon was employed as a Butcher. Emma Maxwell has given a quick progress report on the census mapping project for the Borders being undertaken by herself and her husband Graham. The project seeks to connect the households listed in the census to an online map hosted by the National Library of Scotland in an innovative and exciting project which also attempts, where possible, to link households between censuses from 1841-1861. The current state of play is that 51% of the 1841 census has now been mapped, 1851 is 31% mapped and 1861 census 53% mapped. To use the interactive census returns visit www.maxwellancestry.com. Ancestry launched a 'new search' facility in 2008, hoping it would replace the 'old search' facility in use at that time. Many gave the 'new search' screen the big thumbs down, as it lost a great deal of the flexibility offered by its predecessor, so much so that the 'old search' screen is still available to use on the site. Now Ancestry has revealed that it is to make some changes to the 'new search' screen, though 'old search' will continue to be offered. For more, see its blog post at http://blogs.ancestry.com/ancestry/2010/04/20/preview-of-changes-to-ancestry-com-search/. • Subject to restrictions safeguarding its functions, NLS should be subject to ministerial powers of direction. For more information visit www.nls.uk/about/trustees/nls-bill-consultation.html. The consultation ends of June 23rd 2010. 1) My receding hairline. Clearly a trick of the light. 3) My new Scottish research book. As part of the Barrie 2010 celebrations marking the 150th anniversary of the birth of the creator of Peter Pan, a Local History & Genealogy Fair will be held in JM Barrie’s hometown, Kirriemuir, on Saturday, May 15. The Fair, which is being organised by Tayroots, will provide a host of opportunities for those of Kirrie kith and kin to find out more about the fascinating history of the Little Red Town and the people who have lived there over the centuries, including JM Barrie and his many relatives. And, for those who don’t have a Kirrie branch in their family tree, organisations involved in the local history and genealogical research from across this corner of Scotland will also be in attendance. Organisations which will be represented at the event include Kirriemuir Heritage Trust, Angus Archives, Deceased Online, Dundee University Archives, Abertay Historical Society, Dundee Storytellers Group, Tay Valley Family History Society, Forfar & District Historical Society, Aberdeen & North East Family History Society, Montrose Air Station Heritage Centre and Heritage Arts Auchmithie Residents (HAAR). With so many local history experts, archivists and genealogists under one roof, there’s a good chance of finding even most elusive of ancestors or uncovering the solution to a family mystery – or, if your family is from the Kirriemuir area, perhaps discovering that you are related to JM Barrie himself. There are currently a limited number of spaces available for stalls at the Kirriemuir Local History and Genealogical Fair on May 15. Heritage organisations, professional genealogists or businesses dealing in memorabilia from days gone by, such as old postcards, antique jewellery or christening robes, should contact tayroots@angusahead.com or call Sheila Faichney on 01307 473263. To highlight JM Barrie’s birthday – May 9, 1860 – Kirriemuir’s two-week Festival of Imagination starts on Friday, May 7. As well as the Local History & Genealogy Fair, other events include The Ball of Kirriemuir; a Grand Commemorative Concert; the premiere of new play ‘Home To Neverland’; a live poetry event; an evening of traditional music and song; and children’s drama workshops. For more information about the Barrie 2010 events, visit www.barrie2010.org.uk. For more information about Tay Roots, visit www.tayroots.com. I am not a great fan of tartan - not the designs as such, but the nonsensical rubbish surrounding its history which is basically genealogical bubblegum. However, this raised a smile - the Scottish Register of Tartans has now registered a tartan design for the fictitious Clan McPeek, characters in an adult Scottish fairy tale created by Jack Sullivan. If you're going to wear a clan tartan, this is a good one to go for, and as genuine in its historical provenance as any other! To see the design visit www.tartanregister.gov.uk/tartanDetails.aspx?ref=10188. The American version of Who Do You Think You Are is due to start transmission on BBC1 on Sunday 25th April 2010 at 9.00pm, according to Who Do You Think You Are magazine, confirming what Wall to Wall told me last month (that it would be shown shortly after the US tx had finished). However, the BBC Press Office website has not confirmed this yet, and normally does so two weeks prior to any new series being transmitted, so don't hold that as carved in stone just yet! According to the magazine, it will apparently only be the four editions featuring the women of the US series to start with, followed by Matthew Broderick and Spike Lee later in the year. Emmitt Smith, the American sportsman who most people over here have never heard of, will most likely be having his episode premiered on UKTV later in the year. Each episode will also be 45 mins long. Having already seen the Lisa Kudrow and Sarah Jessica Parker editions, I think most people might be disappointed at how fast they hurtle along compared to their British equivalents. The programmes are being reversioned, however, which hopefully means they will lose the Lion King theme tune at the top and the over the top incidental music! I'll bring more news once the scheduling is officially confirmed. (With thanks to Lesley Powell at the Your Family Tree magazine forum). It was a last minute decision, but I was able to free up some time to go to the SAFHS Conference today in Livingston, hosted by West Lothian FHS - and it was a corker! Local boy Alex Salmond didn't turn up - apparently there's an election on? - but Registrar General Duncan Macniven did the honours in opening the conference, providing a short overview of the ScotlandsPeople story. Some interesting facts emerged from this. The ScotlandsPeople website (www.scotlandspeople.gov.uk) now has a million registered users, with some 700,000 credits purchased last year alone, from customers based in 176 countries. The biggest user in recent times? The Vatican! Those crazy Catholics....! :) Also, some 22,000 visitors used the ScotlandsPeople Centre last year in its first year of opening. The ScotlandsPeople website is due to undergo a major relaunch in September, following Brightsolid's winning of the new contract a few months ago. There will be some new functionality on the site, but the team are keeping their cards close to their chests beyond that on other changes, so stay tuned, though a Catholic records update is due imminently. On the plus side, Duncan seemed to confirm that the 1911 census was due to be released on April 3rd next year, and gave a tantalising glimpse of things to come, with an image on his Powerpoint presentation of a blank enumerator's return for the census, which as mentioned on this blog a few days ago is indeed a two page document, unlike previous returns on one page, and unlike the rest of the UK with the original household schedules made available. Duncan also mentioned that plans were afoot for the roll out of the ScotlandsPeople computer system to local family history centres, and over a coffee later that morning with Dr. Irene O' Brien from Glasgow City Archives I had it confirmed that this will be late summer this year from the Mitchell's point of view. I have a date, but I'll be metaphorically shot if I reveal it! Suffice to say, there is a date, so take heart, the big move from Park Circus is soon to be a reality, and the ability to carry out family history research in Glasgow is going to take another major leap forward! It will be likely that the Mitchell will be the first to get up and running, with other centres following soon after. It was also revealed by the Registrar General that the extension to the wills coverage on the ScotlandsPeople site will be extended later this year. The main talks were provided by Dr. O'Brien, who talked about poor law records (with a West Lothian bias), Dr. Morris Macrae on the story of James Young Simpson (with lots of encouraging advice for me after on researching a particular physician ancestor of mine), Professor Michael Hitchman on the history of the Scottish paraffin industry in West Lothian, and Elizabeth Henderson on the history of Friendly Societies. Last October I announced news of a forthcoming militia databse for Fife from Richard Dickens, covering 1798-1855 (see http://scottishancestry.blogspot.com/2009/10/forthcoming-fife-militia-database-1798.html). Regular reader Tunji Lees has been in touch to say that this is now online, and having had a look, it is definitely worth a look. To research your Fife militia ancestors, visit http://thaneofife.org.uk! Monumental Inscriptions for Abbey St. Bathans, Berwickshire, are now on sale from Borders FHS. For more information visit http://blog.bordersfhs.org.uk/2010/04/new-monumental-inscriptions-volume-for_15.html. One hundred and sixty years worth of material from the Illustrated London news have gone online at http://gale.cengage.co.uk/product-highlights/history/illustrated-london-news.aspx. Sadly though, once again host company Gale has made it exclusively accessible to subscribing institutions only, though the Guardian story below states that this is to be the situation 'initially', so fingers crossed that we mere mortals will get a look in at some point! For more on the release see www.guardian.co.uk/media/2010/apr/15/illustrated-london-news-archive-online. I was on the phone to Deceased Online's Richard Gray earlier - big things are a' coming. In the meantime, don't forget that all burial records from Angus are now online at www.deceasedonline.com. A big thank you to Central Scotland Family History Society for their extremely warm hospitality last night - I think that my talk on Irish resources went down well, so hope it helps! There is a big myth out there in the big genealogical ether that Irish research is virtually impossible, as many records have been destroyed. My take on that when people raise it has always been simple - get over it!!! Many records have been destroyed, not least of which some of the censuses, which were not all destroyed in the Irish Civil War, but in an act of genealogical vandalism many years earlier by the British Government when they were deliberately pulped. But keep the glass half full, not empty, because many records do exist, and the game is certainly not up if you find an Irish ancestor in your tree! Central Scotland's website is at www.csfhs.org.uk, and their next talk is on the Scottish Screen Archive on Wednesday May 5th 2010. Well worth attending, the archive is incredible! Once again, a huge thanks to the society, and for everyone else, don't forget the SAFHS conference in West Lothian on Saturday (www.safhs.org.uk)! I'm giving a talk tomorrow night at Central Scotland FHS about online Irish resources, and just as I was checking details on how to get to the venue, the Smith Museum and Art Gallery, I came across a news story of interest. There's an interesting post on Orkney's kirk session minutes at http://orkneyarchive.blogspot.com/2010/04/jaccuse.html. And the word for the day is 'strumpet'! Then Ancestry learned how to digitise it and made everybody very happy...! Yes folks, Ancestry has once again turned its attention to Scotland, with the release at last of the Perthshire, Scotland, School Registers of Admission and Withdrawals, 1869-1902. This collection of records consists of the registers of admission, progress, and withdrawal of students that were admitted and then withdrawn from school covering the years 1869-1901. The records include the date of admission to the school, the name, date of birth of the child, name and address of parent or guardian, last school attended, date and reason for leaving. It was the responsibility of the Head Teacher to keep these records and update them on a weekly basis. However, not all records are complete and they sometimes omitted to fill in all the columns, especially the reason for leaving. Most of these registers cover schools that have since closed. The records were scanned some three years ago, have been indexed through Ancestry's World Archives Project, and come hot on the heels of the 1802 Militia Act Survey for Perth released last month. Maxwell Ancestry has digitised and made available online more valuation rolls from Dumfriesshire 1896-97 on its site. The collection now includes records for Annan, Applegarth, Caerlaverock, Canonbie, Closeburn, Cummertrees, Dalton, Dornock, Dryfesdale, Dumfries, Dunscore and Durisdeer. Note that the Dumfries and Annan records are the landward parts of the parish only (i.e. not the burgh records). To view the records, free of charge visit www.maxwellancestry.com/ancestry/resources/dumfriesshirevaluationroll.htm. Once again, Glasgow City Archives has reduced its opening hours, following a similar exercise last October which was described back then as 'temporary' (see Mitchell Library - new archive opening times). Yet again there will no longer be late night opening on Thursdays, and Saturday visits are once again by appointment only. Forty of the 1300 children from Guernsey to have been evacuated to Glasgow in 1940 to escape the Nazis are returning this weekend to the city to attend a special exhibition about their story being hosted at St Ninian's Church in Pollokshields. For more on the story visit http://news.bbc.co.uk/1/hi/world/europe/guernsey/8609163.stm. The Scotsman newspaper archive website has a half price offer on its annual subscription until April 10th. The price is reduced to £79 from £159.95. The archive covers editions from 1817-1950. The National Archives at Kew has made a digitised facsimile of a letter concerning William Wallace (the real one, not mel Gibson!) available for free through its Documents Online service. As a result of increasing interest in a fourteenth century letter that mentions William Wallace, The National Archives has made available on DocumentsOnline a full transcription and translation to promote greater understanding of the document, alongside the digital copy of the letter that has been available for some years. The original document remains available for anyone to view in The National Archives, Kew (Catalogue Reference SC 1⁄30, no. 81). Sir William Wallace, having led resistance to the English king, Edward I, travelled to the court of Philip IV of France in 1299 to try to persuade him to support the Scots against Edward. On 7th November 1300, a year after Wallace’s arrival in France, Philip wrote a letter to Rome concerning Wallace. This document is often described as a safe–conduct, passport, or a grant of safe–passage for William Wallace, but is, in fact, a letter from King Philip to French agents in Rome, commanding them to ask Pope Boniface VIII to support Wallace in his case regarding Scottish independence. It is recorded that three safe conducts(from the Kings of France, Norway and Scotland) were taken from Wallace when he was arrested in 1305; however the last time they were known to be in the custody of the English Crown was in 1323 in an inventory of records contained in the Exchequer (document reference E 36⁄268, pp. 238–40). No trace of the safe–conducts has been found after that date. For more information, and to see the document, visit the TNA site at www.nationalarchives.gov.uk/documentsonline/williamwallace.asp. The Public Record Office of Northern Ireland (PRONI) has announced that its Self-Service Facility will temporarily move to Cregagh Library from September. The move is to allow for the relocation of PRONI from its current base on Balmoral Avenue to a new facility in Belfast’s Titanic Quarter. A popular family history resource, which includes church records, the Self-Service Facility allows researchers to look at the records via microfilm. In advance of the closure, PRONI is also taking steps to increase the volume and range of material available to researchers online. The 19th century street directories are now available through the website and additional sources for family history research will be uploaded in the coming months. PRONI has worked with Libraries NI – the new single library service for Northern Ireland – to make sure these popular family history resources will continue to be available for research during this time. This will further strengthen the commitment to strategic partnership between Libraries NI and PRONI who work closely together to provide access to heritage resources. See www.proni.gov.uk or call 9025 5907 for more information. The National Archives at Kew has announced that it will not be releasing any more news stories on its website at www.nationalarchives.gov.uk or tweeting any more on Twitter (http://twitter.com/YourArchives) until after the election in May, as it is part of the Civil Service. Happy birthday Scottish National Party! The Scottish National Party (Pàrtaidh Nàiseanta na h-Alba), the current party of Goverment in Scotland, was founded today on April 7th 1934. The party was formed from a merger of several parties, such as the National Party of Scotland (formed in 1928), and the Scottish Party, a splinter group of the Cathcart Conservative Association. For more on the party's history, see http://en.wikipedia.org/wiki/Scottish_National_Party. There's a search on for those who may have worn the same christening robe as Kirriemuir born J. M. Barrie, creator of Peter Pan. The BBC has the story at http://news.bbc.co.uk/1/hi/scotland/tayside_and_central/8607253.stm. Monumental Inscriptions for the Berwickshire parish of Longformacus are now available from Borders FHS for £7.50 plus p&p, with the disc also including some mortcloth records, militia lists, kirk session records and additional material. For a moment, I thought the curators of Orkney Museum had gone just a tad mad when I read their latest blog post entitled Ging gang goolie goolie goolie goolie goolie goolie goolie woggle. So get out your woggles (though perhaps, with respect, hold back on the goolies! ), and have a look at the post at http://orkneyarchive.blogspot.com/2010/04/ging-gang-goolie-goolie-goolie-goolie.html, which includes lots of images from the Guides movement as held in the Orkney Photographic Archive. The family history society movement in Scotland has an umbrella body in the form of SAFHS (http://www.safhs.org.uk/), which has its next annual conference on Saturday April 17th in West Lothian (see website for details). I'm conscious that the islands only get a look in occasionally, and I'm keen to try to share their news as much as that over here! What many may not realise is that family history is as much a thriving concern in the Western Isles as it is elsewhere, but that whereas family history societies tend to be in ascendancy on the mainland, on the islands, and in some western communities, historical associations, or 'comainn eachdraidh' as they are mainly known in Gaelic, fulfil the same role. If I've missed any out, please let me know and I'll update accordingly! I've lived in Largs since 2002, and have travelled the ten minute ferry trip to the island of Cumbrae on umpteen number of occasions, but the one thing I have never done is to visit the Cathedral of the Isles on the island, the smallest cathedral in Britain, and some say in Europe. Here, for my pennance, I'll happily point you to a blog post on the Scotland for the Senses blog, detailing what to expect, at http://scotland4thesenses.blogspot.com/2010/04/easter-sunday-at-britains-smallest.html. I must do better - a trip is now on the cards...! Declaration of Arbroath - Happy Birthday! Scottish Research Online - 1 week to go!